Playa d'en Bossa's spectacular open-air party venue and clubbers' hotel. Ushuaïa Ibiza has been a shining star in Playa d'en Bossa since its opening in 2011. Located on the main Bossa promenade, this hotel offers stylish accommodation and an exciting events program that boasts some of the biggest names in mainstream electronic music. 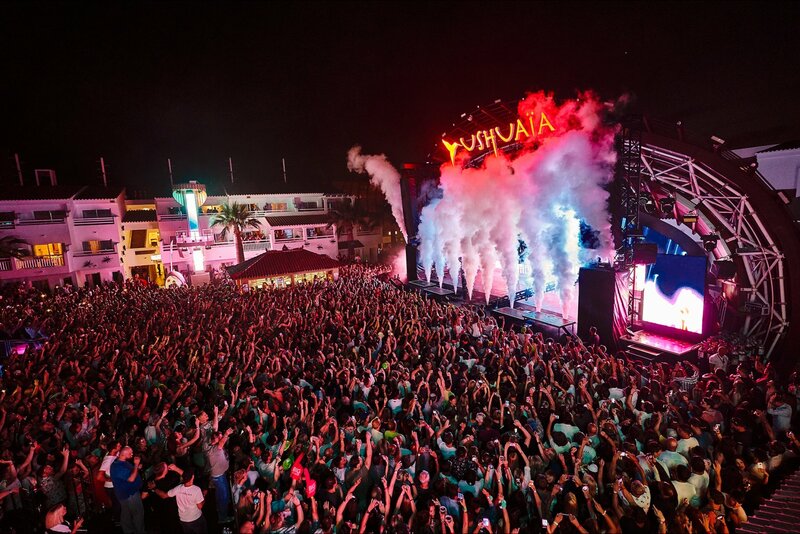 Ushuaïa made a name for itself by championing big-name DJs, and by blowing the competition out of the water with its stage production, glamorous dancers and fantastically placed VIP section. In a few short years, it secured its place as one of the most famous venues on Ibiza. With the exception of the opening and closing parties, Ushuaïa opens from around 15:00 to 17:00 in the afternoon and closes at 23:00. By providing a rare opportunity to see some of the biggest headliners on the island as the sun is still setting, Ushuaïa has become an important force in returning the long-held tradition of daytime clubbing back to the island. Ushuaïa has now expanded to include the luxurious Ushuaïa Ibiza Tower next door, which boasts stunning exterior decor and luxury accommodation, as well as a gorgeous pool area and rooftop lounge terrace with spectacular views across the island. Find here more information about the hotel. Famous for: Outdoor daytime clubbing, the pool, amazing light shows and the world's biggest DJs. Popular parties: David Guetta's BIG, ANTS and Martin Garrix. How to get there: €25 for a cab from San Antonio, €10 for a cab from Ibiza Town. Disco buses run along both these routes at night. Prices: The parties cost from €25 to 60€, depending on the party and time of the year. A beer is €12, water €9, long drinks cost ca. €18. Where to stay: In the Ushuaïa Ibiza Beach Hotel itself - or, if that stretches your budget, find here a wide choice of Hotels and apartments in Playa d'en Bossa.